To compress concertina plumbing pipe up to 110 mm outer diameter. Our concertina tube compression machine is specially designed to scrunch flexible plastic corrugated plumbing pipes up to 110 mm outer diameter. This type of pipe is extruded in an open concertina format. After cutting-to-length, it needs to be compressed in such a way that the corrugations squeeze together. This significantly reduces the overall length of the cut piece, thus saving on packaging & transport costs. The pre-cut lengths of pipe enter the machine un-compressed. They move onto the inlet twin-belt, which runs at normal production speed. The exit twin-belt runs at a slightly slower speed. This speed variation causes the tube corrugations to scrunch together, thus compressing the cut length. Optical sensors can be positioned between the inlet & exit belts to accurately control the amount of squeeze. This ensures the pipe is not damaged or distorted in any way during the process. 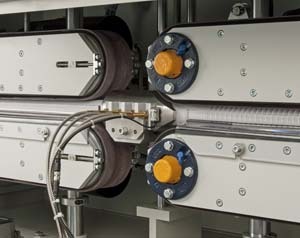 The Compression machine is designed to operate in-line, directly after the cutting machine. In this way the concertina pipe can exit the end of the extrusion line in a compressed format, with no secondary operations required.